DeWitt Holland recently sent me a copy of The Chanco Chronicles - History of Chanco Lodge 483, 1952-1992, which was issued on the occasion of the Lodge's 40th anniversary. 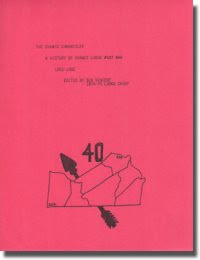 Written by former Lodge Chief (1974-1975) Ben Vincent, this 27 page document provides a wealth of historical information not only about the Lodge but also Camp Waters and Siouan Scout Reservation. Some internet sleuthing helped me find Ben (now in West Virginia and a member of Lodge 550), and he kindly granted permission to publish his document on my web site, which he has visited before. The Chanco Chronicles is a fascinating read, and spans the entire history of the lodge with the exception of the last 3 years before the merger with Kecoughtan 463 to form Wahunsenakah Lodge 333. Ben Vincent, the original author of this document, provided me with updated pages to update the historical data through 1996, the year that the Lodge merged.